[W]e do not, it seems to me, make enough allowance for the Qurʾan’s often deliberate mystification: the self-referential epithet “mutashabah” enshrines the mystification…. This is a text which, while claiming manifest clarity, is at least partially meant to make the flesh creep—somewhat like the “shudder” in T.S. Eliot (cf. Kermode 2010). Or else we might call it the “mysterium tremens”: that which causes you to tremble and to be awed by the divine unfathomable. The mystery is thus quite deliberate and meant to be just that: a mystery which causes a “shudder.” And that “shudder” is so culture- and language-specific that it often defies translation. Khalidi speaks of other obstacles, comments on his various “companions” in the translating process (other translators such as Tabari and Suyuti, plus commentaries and dictionaries), and touches briefly on his own translation. Read the paper in full here. A century ago, Agnes Smith Lewis and Alphonse Mindanao published a short book about a group of very early Qur’anic leaves. The parchment of these fragments, together with that of others written in Syriac, Greek and Arabic, had been reused to create a new book in the ninth century by Christian Arabic scribes, who thereby unwittingly preserved it for later generations. One of the “large Qur’anic leaves,” with Qur’anic lower text and Christian Arabic upper text. Cambridge, Cambridge University Library, Or. 1287, fol. 89v. Copyright: Syndics of Cambridge University Library. He adds that “it is only in the last decade that people have started getting interested in Or. 1287 again…. 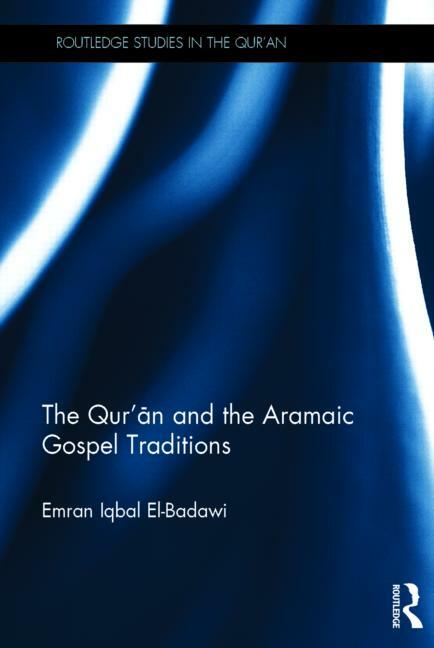 My own focus has been on its Arabic scripts, both Qur’anic and Christian, and on the palimpsest as a historical ?document.” This specific analysis provides an overview of the palimpsest followed by discussions of both the large and small Qur’anic leaves, the Christian Arabic upper texts, and the historical context of the manuscript. 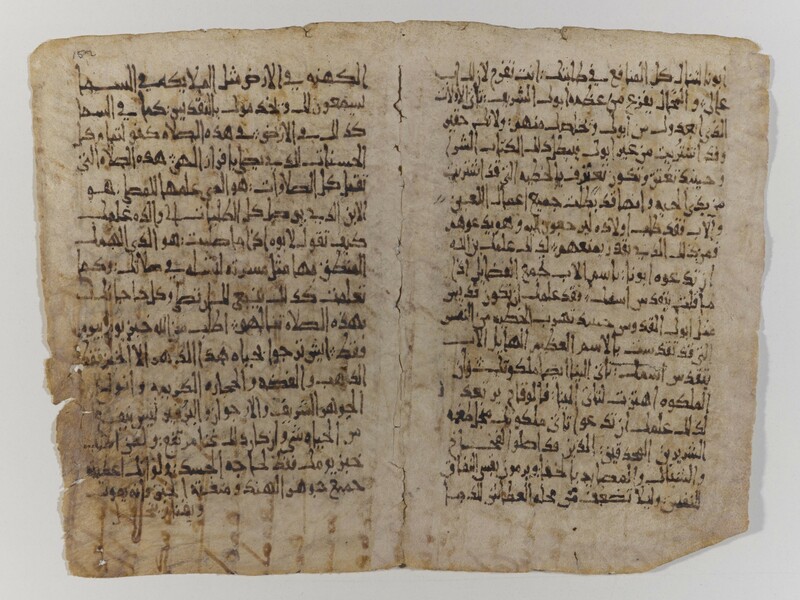 The vast majority of extant leaves in the Hijazi tradition (the modern name for the earliest Qur’anic fragments) were discovered among thousands of other Qur’anic folios in repositories of great historical mosques, such as Damascus, Fustat, and Sanaa. In the palimpsest, this context is reduced to about a hundred leaves, which is small enough to provide the basis for a historical reflection. The manuscript straddles two key eras and milieux, Muslim and Christian, between the seventh and ninth centuries (and more if one takes into account the Biblical and secular Arabic leaves). One key question will be: how did a Christian community living under Abbasid rule come to own very early Qur’anic leaves? For a detailed exploration of this and many other pertinent questions, read the full paper at this link. (It is, in turn, a shortened version of an article by George published in French with full references and illustrations, found here). * Note: This revised version of Dr. George’s paper was uploaded to IQSAweb on December 23rd, 2013. Visitors who downloaded this paper before this date should discard the previous copy and replace it with the current document, here. A lecture on “The Influence of the Qur’an on Western Literature,” by Robert Irwin—given at the Centre for the History of Arabic Studies in Europe (CHASE) at the University of London’s Warburg Institute—can be viewed in its entirety here. Robert Irwin is a widely-published author of both fiction and non-fiction works on the Arab world. He taught Medieval History at the University of St. Andrews and also lectured on Arabic and Middle Eastern History at the universities of London, Cambridge and Oxford. The conference during which the lecture took place last year was titled “Translating the Qur’an” and was organized by Charles Burnett, Alastair Hamilton, and Jan Loop. Stay tuned next week for a special web event: IQSA’s online publication of three papers by Drs. Aziz al-Azmeh, Alain George, and Tarif Khalidi. On November 28th, French publisher CNRS Editions released Le Coran: Nouvelles Approches, the fruit of a colloquium of leading francophone scholars of the Qur’an that took place at l’Institut d’études de l’Islam et des sociétés du monde musulman (Paris, 2009). The work presents thirteen studies divided into three sections: L’histoire du texte (“history of the text”), Le contexte d’émergence (“the context of the Qurʾan’s origins”), and L’analyse littéraire (“literary analysis”). In a detailed introduction, Mehdi Azaiez—editor of the work, along with Sabrina Mervin—presents an insightful analysis of the complicated state of Qur’anic studies, along with an overview of the work’s articles. [See below for the full Table of Contents listing]. Le Coran: Nouvelles Approches includes articles from leading francophone scholars—along with a contribution by Angelika Neuwirth on the Qurʾan and Late Antiquity, translated into French—on topics of significant interest at the current moment in Qurʾanic Studies. It will thus serve readers as a guide to the most important work of contemporary French language research in the field. Le Coran: Nouvelles Approches is dedicated to the memory of Mohammed Arkoun, and fittingly so. The conference on which it is based took place at the institute which Prof. Arkoun founded, and the level of the scholarship in Le Coran: Nouvelles Approches does justice to his memory.